Google Nexus 7 2 review: With the highest resolution screen so far on a 7-inch tablet, can this Android device take on the the iPad Mini? Update: The Google Nexus 7 2 release date has been confirmed as 28 August 2013, around a month after the device was launched in the US. The new Nexus 7 will be priced at £199.99 for the 16GB version and £239.99 for the 32GB model. 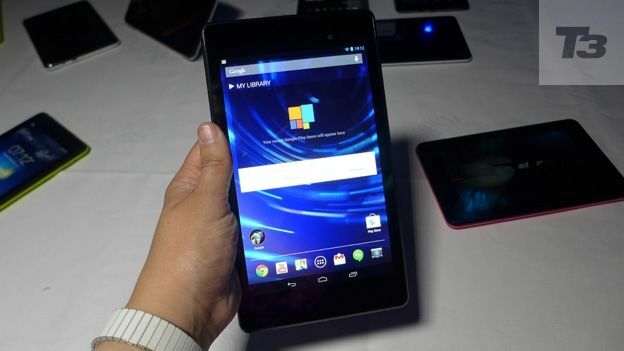 The original Google Nexus 7 by Asus really kickstarted the market for the mini tablet, and was launched well before Apple's iPad mini, pitting it against the Kindle Fire. With this second generation, Google has really declared war on the iPad mini - and with a screen that's the highest resolution in its class. While Apple reportedly struggles to make a mini with a Retina display, Google and Asus have unleashed the new Nexus 7 2 with a jaw-dropping 1920x1200 display such to turn Apple green with envy. In fact, it's not just the screen that's had a major upgrade. Gone is the slightly tacky rubber back, replaced with a much smoother, grippy rear surface and new, sleek black lines that make this look, well, cool - something unheard of in the Android tablet market until now. The Nexus 7 is, without doubt, the best non-Apple tablet on the market. The speed, screen and attention to detail make it head and shoulders above the rest, and nipping at Apple in terms of design and feel. It's easy to use and hold in one hand, and thanks to the placement of the speakers, also an excellent portable media viewer, managing to eclipse even the Kindle Fire HD and the bedtime tablet of choice (and much more portable than the iPad 4, Apple's big boy tablet which has a comparable Retina screen). For owners of the original Nexus, this is also worth a look - it's a complete overhaul rather than an upgrade, and one look at the gorgeous screen in action will have you rushing to Google's site to order. Along with the high resolution 7-inch screen, the newest Nexus boast s 16 or 32GB of storage, along with wifi and, in the US a 4G LTE version (although it is unclear if this will arrive in the UK). There's also a front 1.2 megapixel camera and, unlike the first version, a rear camera as well, with a 5 megapixel sensor. There's a micro USB port for charging, although you'll need to use the supplier wall charger to get the most effective charge. The screen is the Nexus 7's killer feature, and it's amazing. With a resolution of 1920x1200, it's higher definition than Apple's iPad Retina screen (although in all honestly you can't tell the difference between the two). However, Google and Asus have managed to do what Apple can't (yet, anyway) and fit the HD screen into a 7-inch tablet. It's hugely impressive, and breathtaking when displaying 1080p video, which looks bright, vibrant and flawless. Pictures also looks stunning, and one hopes that developers will soon be releasing apps that take advantage of the extra resolution. Unsurprisingly, the processor and graphics systems also got a big boost to deal with the power needed to drive 2.3 million pixels, and there's a 1.5 GHz Snapdragon S4 Pro at the heart of the Nexus 7. As with the original Nexus, charging is a little fiddly, and the Nexu 7 seems very particular about which charger you use. It also has support for wireless charging through the QI standard, but were were unable to try this out. Google promised nine hours of battery life while watching video and ten hours while browsing the web, and this seems a pretty good indication of our findings - this is certainly a tablet that'll last most long flights, and give you a day by the pool without rushing for the nearest wall socket. The Nexus 7, available within weeks in the UK and already on sale in the US, is without doubt the 'best of the rest', and the most impressive Android tablet to date - as well as being a superb entertainment device. It's still slightly crippled by a lack of decent killer apps, but in terms of hardware, at least, Google has shown it can match Apple, and actually improve on the iPad.